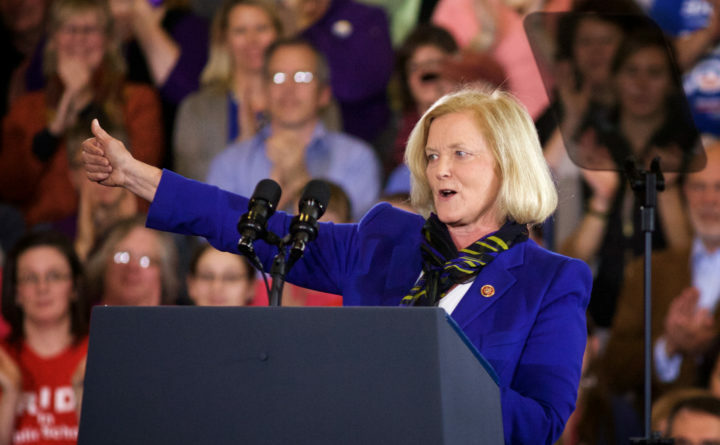 Democratic U.S. Rep. Chellie Pingree speaks at a rally in Portland, Oct. 30, 2014. Maine’s Democratic congresswoman is pushing back against the federal government’s plan to place labels on foods that were produced with genetic engineering. But the use of the unfamiliar term “bioengineered” is destined to confuse consumers, and the USDA is essentially launching “a marketing campaign aimed at putting a positive spin on GMO food,” Pingree said. She added that she would fight the new standard as a member of the House Appropriations Subcommittee on Agriculture, which oversees USDA funding. “These labels should give people the facts of whether ingredients in their food have been genetically altered, plain and simple,” Pingree said. The scientific consensus on genetically engineered food is that it’s safe to eat. The Food and Drug Administration has also stated it has not found that such foods differ substantially in nutritional value. Still, they are the subject of longstanding debate involving food producers, food scientists and consumers about whether they should be labeled. Congress passed a disclosure standard for genetically engineered food in July 2016, and the USDA said Dec. 20 of this year that it will be mandatory for food manufacturers by 2022. The department said the use of genetic engineering in food products can be disclosed by “text, symbol, electronic or digital link” and a few other avenues. Maine was the site of an effort to label genetically engineered foods at the state level earlier this decade, when it crafted a law to label such foods if five contiguous states did so, as well. The federal legislative effort pre-empted that drive, leading to criticism from some Maine advocates who wanted the state standard.